HUGE Sale on NOW! Orchid Luxury Residences (apartments) located in the 5 Star Hilton Hotel Surfers Paradise, but managed by our professional team. 4 Resort pools, spas, gym, etc.,.,. With us, what you SEE is what you GET!!! Choose the exact apartment you would like to stay in. SEND a MESSAGE now! When you request to book through Stayz we will allocate you a 3 bedroom apartment in this resort with amazing full ocean views. This is your chance to secure the most Luxurious Accomodation available in Surfers Paradise, with the BEST ocean views at ridiculously, crazy PRICES. Located in the Hilton Surfers Paradise Resort, but managed by our Professional Team, this is the ultimate luxury at a fraction of the normal PRICES. Check in with our office across the road then enjoy the ultimate luxury! HOW can we do it so CHEAP ? EASY, we are a boutique company that only manage a handful of luxury apartments in Surfers Paradise, which means we don't have the HUGE overheads of the on site managers. Hence, we are able to offer you the accomodation you DREAM of, at CRAZILY, RIDICULOUS PRICES. 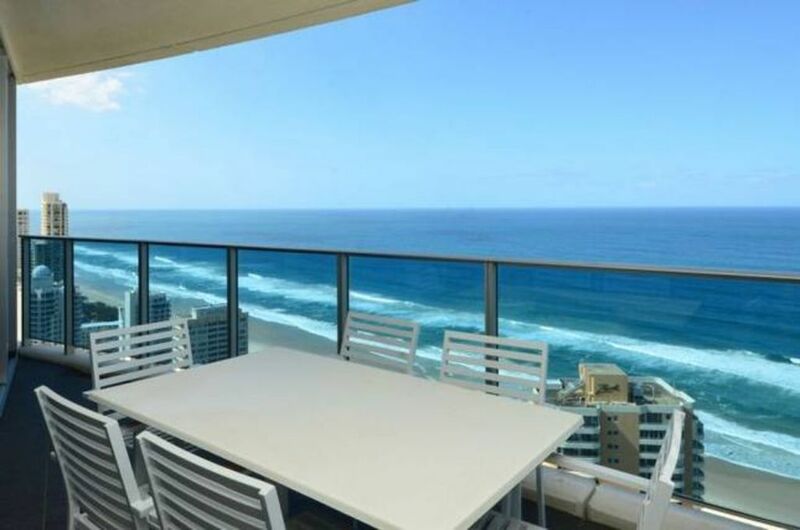 Look at this apartment in the Orchid Residences, located in the Hilton Surfers Paradise Towers. MASSIVE sky home on the 33rd floor. 3 bedrooms with floor to ceiling windows, offering the most outrageous ocean views while lying in bed. Now this is what dreams are made of. Imagine waking up, watching the waves roll in, before you even move a muscle. This is ridiculous LUXURY. 2.5 bathrooms, a full kitchen and Laundry, massive balcony, free foxtel, free WIFi, the list never ends. Check out the actual photos of this apartment above. Please note that the photos used on this advertisement are for sample purposes only. To choose actual apartment for your stay please SEND MESSAGE if you request to book we will allocate you a full ocean view 3 bedroom apartment in this resort. This is just one of our many luxury apartments we offer at crazy PRICES. All our luxury apartments are located right smack bang in the middle of Surfers Paradise, so park your car and walk everywhere. The tram stops right at your door, and can take you to the Casino, the HUGE newly renovated Pacific Fair Shopping Centre, etc,.,. If you are coming to the Gold Coast, there is no where else you would want to stay, and there is no where else that you can get this ridiculous Luxury at these crazy Prices. The reason why we get so many good reviews on all our websites is easy, we offer quality apartments with ridiculous VIEWS and we rent them at crazily cheap Prices. Don't miss out on these luxury apartments, request to book NOW. Great stay and great facilities. Had a good experience with the holiday rentals staff, as far the Hilton staff, not so great. Had a fantastic short stay in this beautiful unit. Lovely views. Accessible to everything Surfers Paradise has to offer.